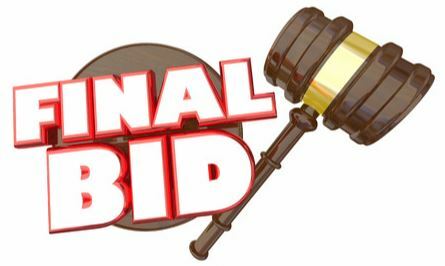 How to Win at a Real Estate Auction | Wilson Auction & Realty Co, Ltd. While there are no guarantees in life except death and taxes (and probably laundry, too, while we’re at it), there are some ways you can be prepared to win at a real estate auction. The key word here is preparation. Just like the early bird gets the worm, the well-prepared bidder is more likely to win the real estate property they’re interested in acquiring. First, it’s good to be pre-approved by a bank in order to know that you’ll be able to get the money needed to cover your purchase. Some auctions require that you bring with you a certified check that goes toward a required percentage of the home you buy. That said, research what your particular auction rules are beforehand so you know what to expect and what to bring should you indeed win it! Oftentimes, it doesn’t hurt to bring your pre-approval letter for financing with you, which shows you have the funding needed to make your purchase. Besides being ready to pay for a place, you also need to research the place you might acquire. Rather than just go with whatever info is provided, wouldn’t it make sense to drive to the property, get out of the car, and walk around? Explore any potential real estate you might want to buy before you actually go to the auction. Seeing how it looks in person can help determine how much you’re willing to spend on it. You get to check the property’s exterior condition and judge it for yourself– and you can tell a lot more about a place in person than you can from just photos on the computer. By the way, if you find some “red flags,” you can use them to deter other bidders from bidding, such that you win it– as long as you’re okay with those red flags and prepared to deal with them. It’s also important to see what’s nearby the property you’d buy– is it in a “good neighborhood” or a “bad one?” Will the value go up in the future or not based on neighbors and such? Finally, when you attend a real estate auction in person, consider wearing professional clothes such as a suit and tie. This not only makes you look professional, but also gets other bidders thinking you’re some sort of big deal– perhaps an investor or bank representative. Hopefully the way you dress and the way you confidently carry yourself helps strike some fear into the hearts of the competition, such that you win! For more info about real estate auctions, contact Wilson Auction & Realty at 1-866-870-5500.